Women’s rock climbing emphasizes precision over power, technique over raw strength. But it cannot be denied that rock climbing does need a modicum of strength if you wish to do well in it. 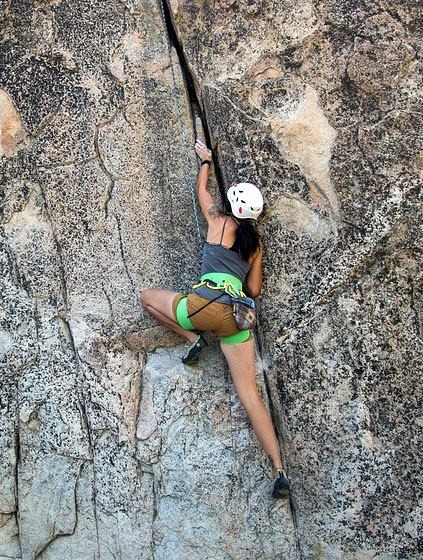 This is why many women feel intimidated and end up staying away from climbing. Be honest and admit that strength will benefit your climbing. Many women tend to get defensive when they realize that they lack power. They make the excuse that power will not benefit their climbing. This stunts growth and prevents them from even taking the first step. You need to admit that you will benefit from more power. Focus. Bouldering is a great way to increase your strength, but they are not magic bullets and require repetition and perseverance before you reap the benefits. Focus and don’t give up immediately when you don’t feel results. Impose self restrictions. The principle behind building power and strength lies in constantly testing your limits. You’re not going to progress much if you are not feeling any hardships. So avoid comfort if possible. Climb without heel hooks or without using drop knees. This forces you to rely more on power when completing moves. Rely on strength-building exercises. Climbing is not the only activity that can help you build power. And thank god for that. You don’t always have the option of going to an indoor climbing area or the Joshua Tree Park, but you can always go to the gym or do some push ups and pull-ups at home. Practice unfamiliar styles. In rock climbing, strength and power will be useless if you are not able to use it effectively and dynamically. If you only practice one style, you will be unable to use your strength effectively when a move requires a style outside of your comfort zone. Finally, any learning experience will benefit from having someone experienced and knowledgeable around to help you. Uprising Adventure will pair you up with one of our friendly expert climbing instructors, and you will get proper training on climbing, And you’ll also get a good climbing experience with a fun, enjoyable climbing buddy. Contact us now and we’ll answer all of your questions.